Vodka tonic cocktail - ingredients: 50g of vodka, tonic. 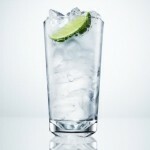 Preparation: pour vodka into a tall glass over plenty of ice. Complete the tonic, stir and serve.